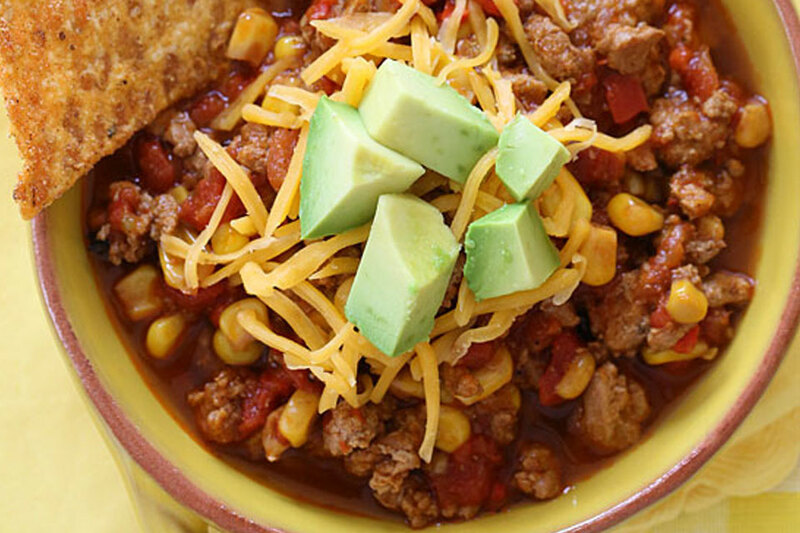 This mild kid-friendly crockpot chili, courtesy of our friends at SkinnyTaste, is made with lean ground turkey, corn, bell pepper, tomatoes and spices. Top with with crunch baked tortilla chips and watch your little ones gobble it up. This chili can also be made in large batches for freezing and reheating. Add the oil to the skillet and sauté the onion, garlic and bell pepper over medium heat for about 4 to 5 minutes. Spoon over turkey into the slow cooker and stir in corn and tomatoes, tomato sauce, cumin, chili powder, paprika and salt, mix until well blended. Pour chicken broth into the crock pot and add the bay leaf. Cover and cook on HIGH 4 hours or LOW 6 hours. Serve with desired toppings. 21 Day Fix: 1 red, 1 green, 1/2 yellow per serving. Adding toppings such as cheese (blue), avocado (blue), Greek yogurt (red) or tortilla strips (yellow) would add to the calorie and container count.